Barnes & Noble Book Fair by The Raving Press - The Raving Press The original Raving Press since 1998. Buy Lost: Children of the River (or ANY eligible item!) at Barnes & Noble stores nationwide or online and support our non-profit organization. Even if you are only buying coffee! 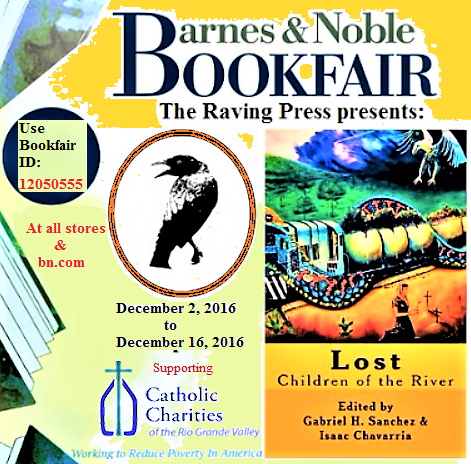 We’re hosting a Barnes & Noble Bookfair for Catholic Charities of the Rio Grande Valley from Friday, December 2nd, 2016 to Sunday December 11th, 2016 at stores nationwide and online. Catholic Charities will earn up to 20% back on purchases you make during our bookfair. You can buy online from December 2nd to December 16th and a percentage of your purchase will count toward our bookfair. Be sure to use the web address (www.bn.com/bookfairs) to do your online shopping. When you’ve finished selecting your purchases, click on your cart and begin the check-out process. In the Payment section, scroll down to the bottom where it says "Check this Box if this is a Bookfair Order." If you already have a BN.com account with a default payment method selected, you will only see a Checkout Summary screen. To add the Bookfair ID to the payment page, you will need to click on the Change button on the right-hand side of the Payment Section. This will take you back to the payment page, where you will scroll down to the bottom of the page until you see “Check this Box if this is a Bookfair Order.” Check the box and enter our bookfair I.D. number, above. After placing your order, you can log back into your Order Summary Confirmation to check to see if the Bookfair ID number is listed on your order. If it is, everything was done correctly. If you need assistance please call Customer Service at 800-962-6177. Provide your order number and our Bookfair ID number, and the representative will manually add your order to our Bookfair sales total. Please note that some items, such as gift cards, ebooks, textbooks, magazines and Barnes & Noble Memberships are not included in bookfair sales totals. However, NOOKs are included! We earn 5% back on any NOOKs you purchase! Please SHARE this with your friends and family. Every purchase counts toward supporting Catholic Charities of the Rio Grande Valley. Thanks again for supporting our Bookfair! You can print out and use this at the register, or show the number from your phone screen if you are at a Barnes & Noble location anywhere in the U.S. Or simply insert the code at checkout online.